Last night, regular ByTheGlassShow.com host Brett Hubbard was teaching a beer class, so I got the call up from the minors for my hosting debut! We welcomed Terrapin Beer Company's Florida Sales Manager Andy Rattner to the studio to tell us about the brewery and sample some of their beers. After some wicked weather delayed the start of the show, we managed to put together a really fun live broadcast, which you can watch over an over again! Oh, and forgive the lack of pictures as I was a little busy, but if you click some of the links below, you can see some photos I took in the past. Andy told us a little about the history of the brewery and what's to come. We all thought Terrapins were from Maryland, not Athens, Georgia where the brewery is located. But apparently brewery founder Spike Buckowski is a big "Dead Head" and the Terrapin name comes from his love of the Grateful Dead and their Terrapin Station album. You will see the theme repeated in other beer names and the awesome artwork on their labels (and cans!). Terrapin Beer was born from having their beers contract brewed, out of necessity. Once established, however, they took the reigns and today brew almost all of their beer in Athens. Their very first beer, Rye Pale Ale was barely on the market in 2002 when it won Gold at the Great American Beer Festival in a crowded pale ale field! That was enough to get them some attention and investment in their business. Flash forward 12 years and the brewery has expanded and now distributes beers in 11 states. Jason chimed in halfway through that introduction asking for our first beer. We started with Maggie's Farmhouse Ale, Terrapin's summer seasonal saison brewed with fresh Georgia peaches. The aroma is really terrific, full of sweet peaches, very rich. The flavors, however are not sweet at all. Rather, this is lightly tart, tangy, and has all the peach flavor without its sweetness. Andy told us they let the yeast just eat up all of the sugar from the fruit to accomplish this. Moving right along, Andy broke out a few cans of their new session beer called RecreationAle. This is the first beer that Terrapin canned. I asked if this RecreationAle was a product of their Side Project series, as Maggie's was originally Side Project 7. The answer was no, but the story behind the creation of this hopped up session ale was pretty funny. It turns out that Easy Rider Magazine didn't appreciate Terrapin's Easy Rider beer a few years back, thus the name change to RecreationAle. The beer was full of citrus, quite hoppy, and very refreshing. That's when Andy told Jorge and Jason that he was opening the second IPA of four in the lineup for the night! Not being hops lovers, they almost shut down the tasting right there, LOL. Next up was Terrapin's new year-round called Hi-5 IPA, brewed in the West Coast style. I went for a high five with Jorge and he left me hanging! Was awkward! The beer was great, full of citrus and terrific hoppy bitterness. Jason said it was "at his threshold" for the style and was getting nervous about what was to come. Hi-5 IPA was also canned, Terrapin's second canned beer, so I asked Andy about that trend and if Terrapin was going to go in that direction. The first time I asked, he cracked a joke, but by the end of the night I think he gave ByTheGlassShow the scoop that though it wasn't his decision, he thought all of the brewery's 12 ounce bottles would be eventually replaced with cans! Jorge's face grew pale when Andy introduced Terrapin's best selling beer, Hopsecutioner India Pale Ale! But both he and Jason were pleasantly surprised that this beer was much maltier, richer, more balanced and lost most of that grapefruity citrus bitterness found in the other beers. And after the show, Jorge was drinking it right out of the bottle! Terrapin still brews their original Rye Pale Ale as a year-round offering. They even took that beer to another level in the past with their Rye Squared Imperial version. And now, to change things up, they are welcoming Rye Cubed as part of their Monster Beer Tour Series. This series is a second seasonal trio of beers that alternates between the other seasonal offerings. Big malty flavors, very rich, loved it! I asked why Terrapin uses so much rye in their lineup. Andy said that besides being a favorite of Spike, he thought that the flavors it imparts on beer could be interesting for a person that normally drinks whiskey. 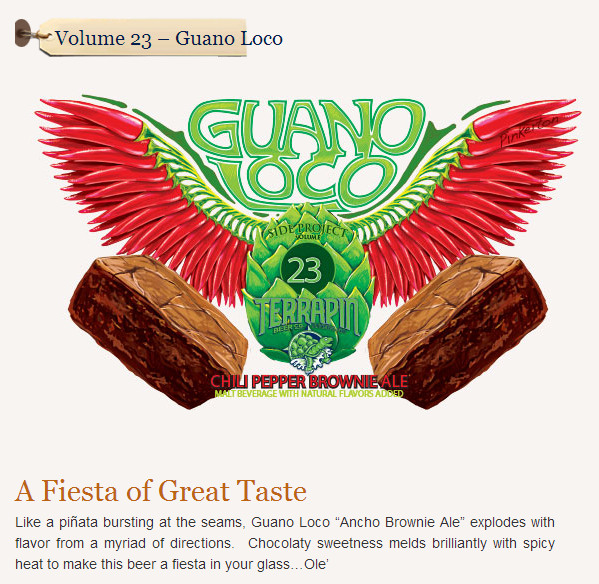 I couldn't believe the hour was almost up, so we went right to the last beer, Side Project 23 Guano Loco, a beer brewed with ancho chilies and brownies. After Jorge confirmed pretty much what Urban Dictionary said regarding the name, we tasted that beer. Very interesting . Rich brownie flavors with a building spicy heat in the finish that lingers in the back of your throat and chest. Fun beer! I asked what the goal of the Side Project Series was, whether to just have fun and be creative or to experiment in the hopes one was so popular that it could join the regular beer offerings. Andy said a little of both, but mostly for experimental fun. If the latter happened, so be it! And at least 6 or 7 of the 23 total have made that leap including the soon-to-be-released year round offering Liquid Bliss Chocolate Peanut Butter Porter! Yum! What else about the brewery besides dominating the Southeast IPA scene? They enjoy working with other breweries on collaborations and currently have one with Green Flash available called Tangerine Dreamsicle Cream IPA. Terrapin has teams of employees home brew in a competition with the winners having their beer brewed the next year. Andy was pretty excited to talk about that since his team won last year and their beer will be released later this year. I can't wait to check that out. Thanks to Andy for the beers and a very informative hour. And thanks to the show for the opportunity to play guest host!